liza jane sews: More Shirts! I made more shirts! Can you believe it? I made two, although one is a success and one not so much. After my shirt making adventure recently, I was pretty sure I would take a good long break from sewing collared shirts. But I received so much good advice from everyone in the comment section that I decided to have another go. Pattern Description: Honestly, I don't have any great take away from this shirt sewing experience because this shirt style is so different. This is not a traditional shirt pattern, as you can see. It's a BurdaStyle pattern-- Gathered Peplum Blouse 03/2015 #109. 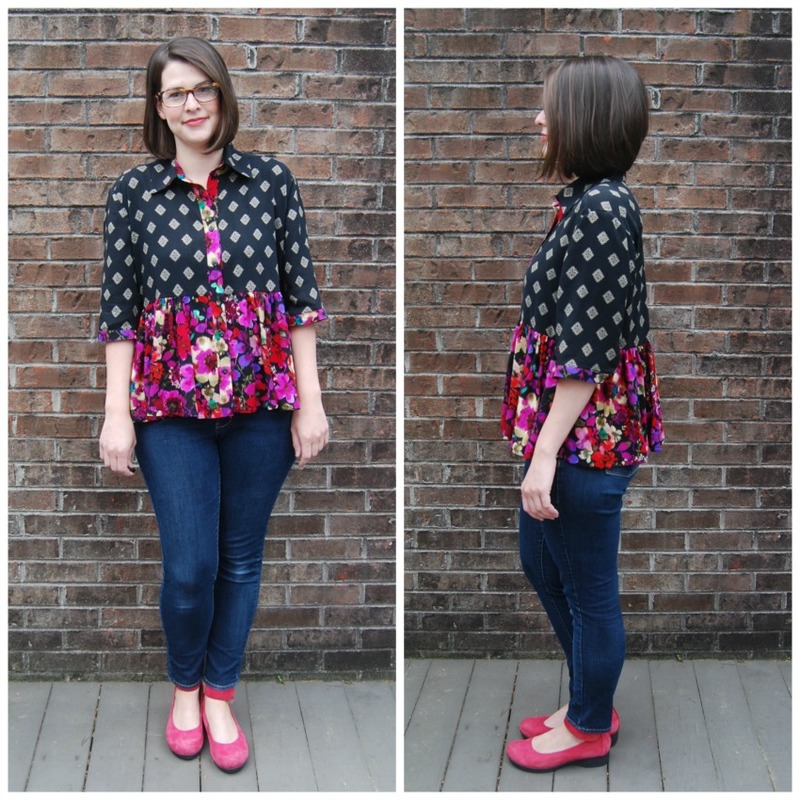 It's a very roomy and wide blouse with a gathered bottom. I'm not sure I would call it a peplum but I don't really know what to call it. I actually bought this pattern from the BurdaStyle website last year around this time of year. I printed it, taped it together, traced it and added seam allowances and then lost all steam to actually make it. I find pdf's to be a lot of trouble. Anyway, after reading a couple of comments on my post about shirt making that recommended I try a shirt pattern that had a back yoke and pleat detail, I remembered this pattern all ready to go in my sewing room. Pattern Sizing: I cut a 40 and it is really wide. The style is supposed to be roomy and boxy but I could have gone down to a 38 easily. Also, the shoulders are super wide. Maybe they are supposed to be slightly dropped. I'm not sure. I had a few comments on my shirt making post that have me paying attention to where the shoulder/armscye seam hits. This shirt tells me nothing about that, though! I left the shoulder seam as is, however. When I make a more traditional shirt again, I will definitely look at the width of the shoulders. Fabric Used: Both versions are rayon challis. For the black version, I used two different rayons I found at Joann's. Not sure if they were meant to go together or not, but the tan color is a perfect match between the two. I had fun deciding which parts of the shirt would be made from which fabric. The black shirt is a definite favorite. I love the way it turned out. I didn't worry too much about matching those diamonds but I did try and keep them straight when I cut out the pieces. I did an ok job. It veers off a little in places. 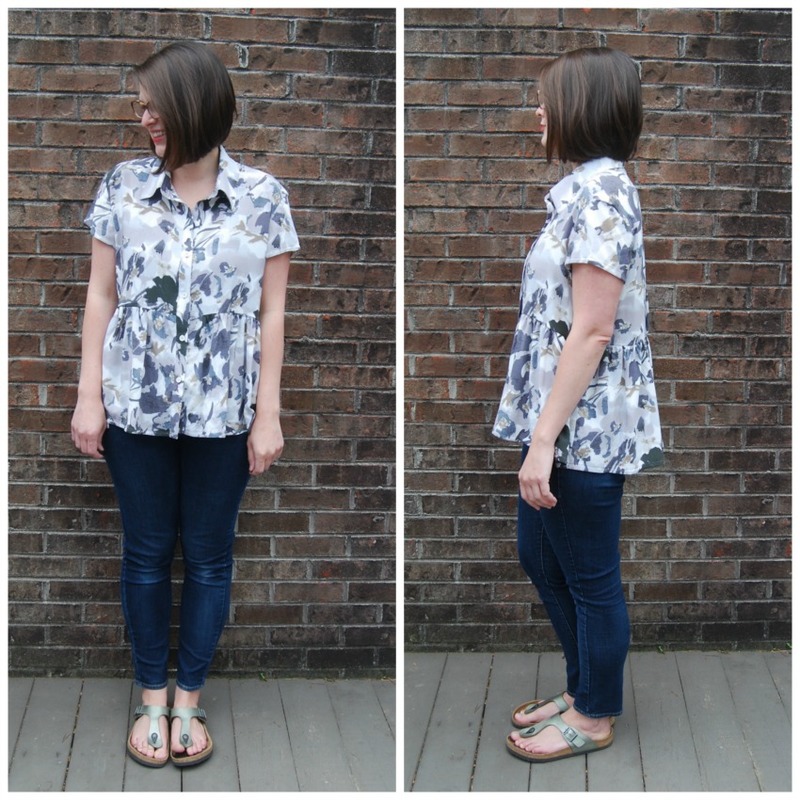 The grey and white floral short sleeve shirt is a super cheap rayon challis I found at Hancock. I'm not as in love with it as the black version. The grey and white print combined with the style of the shirt reminds me of the Golden Girls for some reason. Like 80's retirement home chic. It's a little frumpy. Alterations/ Deviations: I made changes to the sleeves on both versions. When cutting out the black version, I turned the one piece sleeve in to a two piece because I didn't want to try my first ever tower placket in rayon challis. I did cut long sleeves, but later decided to shorten them to 3/4 length. I finished the hem of the sleeves with a skinny band instead of a wide cuff. I did keep a placket opening and did a buttonhole on the cuff to close it. On the short sleeve version, the sleeves are really the reason I don't really like it so much. I wanted to do a sleeveless version originally. But when I sewed it up without sleeves, I couldn't figure out how to finish the armholes. The shoulder seams are too dropped for binding and I couldn't wrap my brain around adding a sleeve band or something similar. I didn't think it through. So I cut sleeves from the pattern using the last little bit of fabric I had left. This is all the length I could do. Meh. I also added an inch to the length of the shirt which I think contributes to the frump factor. And I only did four buttons instead of five ( I spaced them myself on both). There really needs to be a button in the middle where the gathered seam sits. Oh, and I left off the pockets in both versions- front flap pockets and in-seam pockets. Likes/Dislikes: I really love the first version I made with the 3/4 length sleeves. I love the print mix and the swingy, gathered bottom. It really is the perfect blouse to wear to work. It's easy to wear but funky and semi-professional looking. The grey version needs longer sleeves, I think. I am tempted to go back to Hancock and check for more of that fabric to redo the sleeves. The short sleeves make it look dated for some reason. If I ever make this pattern again, I will narrow the shoulder width a bit and maybe downsize the collar. But other than that, I like it. I am much happier with this shirt making experience than the last. And yes, even though I'm not sure I did that back pleat correctly, I am liking the feel and fit of the back yoke versus no yoke. I don't notice the creeping back neckline that I lamented about before but that could also be a result of using a drape-y fabric. Conclusion: Fun shirt pattern. 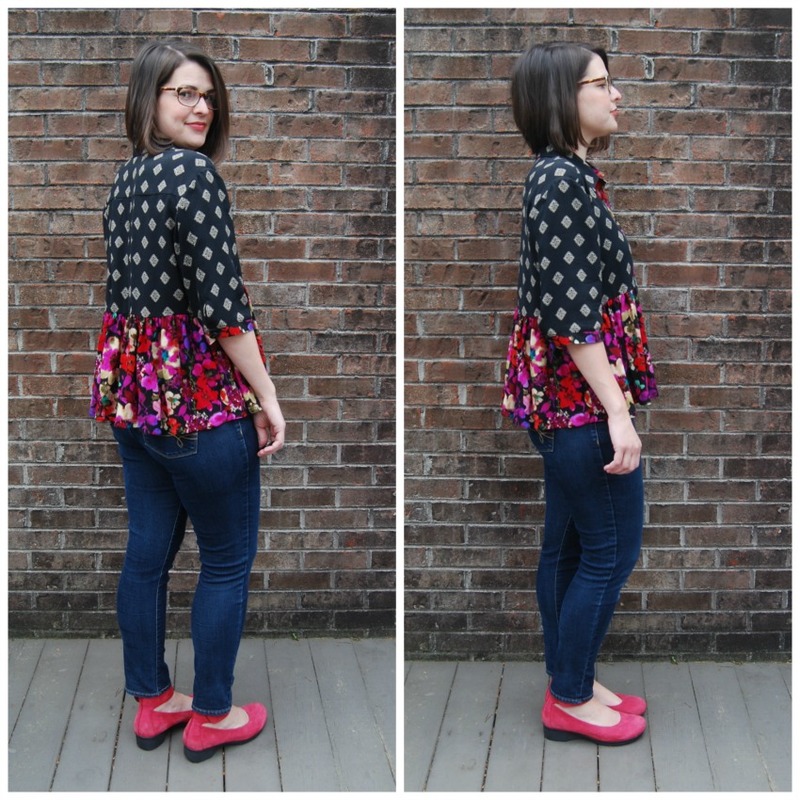 I will definitely look at shirt patterns with a back yoke from now on. And maybe one day I'll try my hand at a tower placket. I love the black version and it is already being worn frequently. The grey version will get some wear as is, but I'd love to revisit those sleeves. So fun! I love mixed prints and your black version of this top is really wow. I was so interested to see this! I've also made this shirt but it's unblogged... largely because I'm so time poor these days and I guess I don't like it on me much! I will eventually blog it - maybe! That said, I like it much better on you! The first version is particularly nice. Oh, I hope you blog it! I was pleased with the pattern. In fact, if I try a more traditional shirt pattern later, I'll look for a burda pattern. Lol! That is a major compliment coming from you and your awesome print mixing skills!! These are so cute!! The mixed print one is especially good. Such a fun shape for a shirt! I love both of them. I think leaving off the front pockets was a good idea; it seems to me that they would take away from that sort of soft drape-y/floaty look (can't think of any other way to describe it). It is possible that you aren't as thrilled with the second one simply because you're comparing it to the first one which has a little more pizzazz with the higher contrast mixed print. You could try basting a contrast lace edging to the hems to see if that would make you like it more. Honestly, to me both are beautiful in their own way. I'm also not wild about doing detailed work in challis, so whenever I do I always starch the daylights out of it first. Starching would have helped me when cutting out and trying to line up those diamonds!! I did block fuse the collar, collar band and front placket and that definitley made a difference when cutting out. Love your tops! I meant to comment on your previous shirt making post, but forgot. You have the same rotating shoulder/elbow posture that I do - you can tell by how your palms turn. Look at this - https://www.pinterest.com/pin/105201341273436492/ Jennifer Stern posted about it here - https://www.pinterest.com/pin/105201341273457126/ Thought this might be interesting to you. Hope it helps. Hey Beverly!! I glanced at one of these pins earlier at work and it looked fascinating. But now I can't get Pinterest to behave for me for some reason. But thank you so much for the links!! I am definitely going to investigate. I think Oona sums it all up perfectly. She must be Succinct But Hilariously On Point Comment Jedi. I have to admit that I love me some Golden Girls!!! Yes to putting longer sleeves on the grey one - maybe you'd feel more life yourself with a bold coloured accessory? 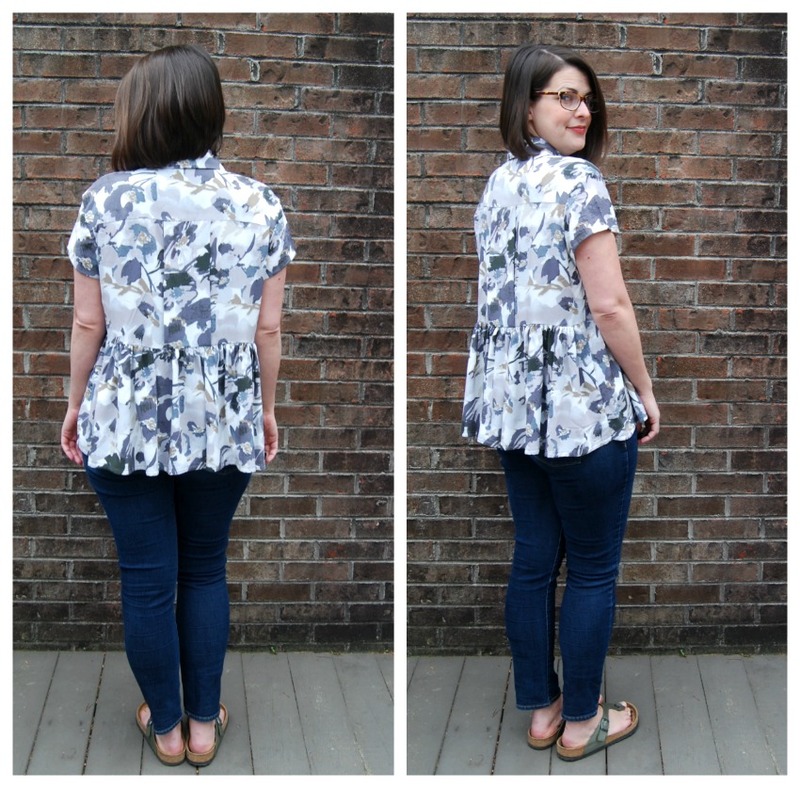 You know I love a ruffle, and I love this pattern on you! I love these!!! I always did love the Golden Girls, but I have to say, you'd need bigger shoulder pads if that's what you are aspiring to. Love the first shirt, the print mix is genius. Love this shirt! I especially like the first one that is made with colorful fabrics. You are so brave to put those together and it turned out fabulous! I have a hard time combining fabrics. You definitely went for it and it looks awesome! These are so cute! I especially like the mixed print one- it is so chic and looks really easy to wear. 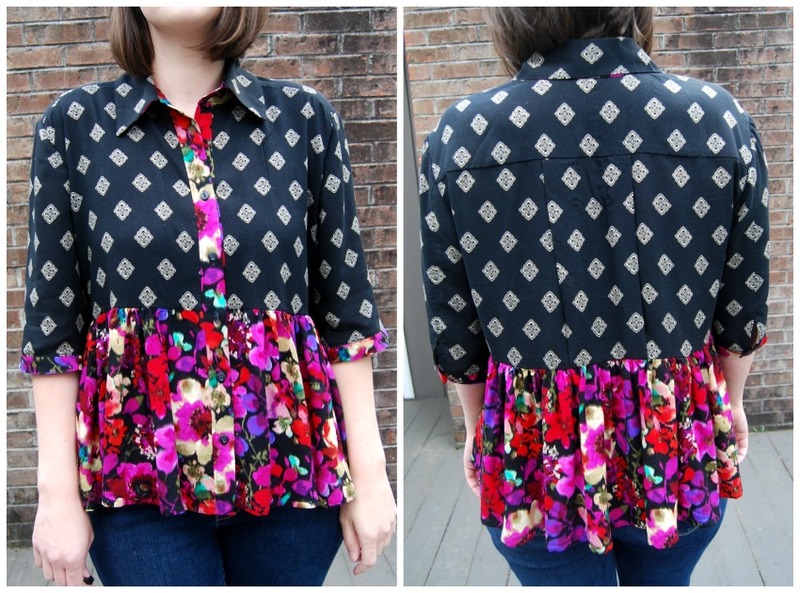 That black and floral on is AMAZING!! I absolutely love it!! I'm so happy you enjoyed the shirt making this time. Hooray for not giving up. I like the greyish one too, but I'm with you on the sleeves. I have 2 Archers that I made short sleeved, and I rarely wear either one. I'm not sure why, but I just don't like that mid-bicep sleeve on a button down. It honestly looks fine, but I can understand what you are saying. What if you made the more of a capped sleeve, would that work? I really need to try some cool fabric combinations like this! Ah these are lovely, the black one is so funky. Think you are being hard on the grey version, it doesn't look frumpy honest. But if you'd feel happier with the longer sleeve redo then you'll reach for it all the time. It's a flounce, that strip of fabric at the bottom, I believe. I love the first version; very lively.